At Monogram Picture studio today I created (and buried) a role of a newspaper photographer in "A Palooka Named Joe" with Leon Errol and Joe Kirkwood. After eighteen acting jobs in a row at Columbia Pictures' short-subject department, Emil got a second film role at Monogram Pictures. In his first job at Monogram, he was only an "extra" with no lines to deliver. 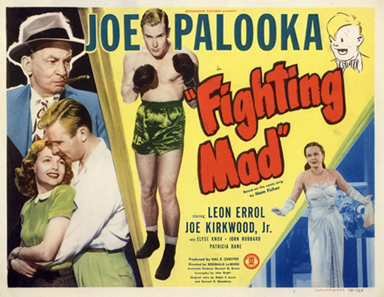 This role in FIGHTING MAD is what is known as a "bit" part, not really much more than an extra, but Emil was assigned a few lines in the role of a photographer accompanying some reporters. Even though it was a small part, Emil made the most of it. The doorway is filled with reporters. Ann enters and tries to get through, but has no success. One of the men turns and sees her. PHOTOGRAPHER [Emil]: Hy'ah, Miss Howe. Want through? ANN: (smiling dubiously) Do you think it's possible? He begins vigorously plowing through the mob, using his elbows freely. Ann follows in the opening he clears. The photographer and Ann break through into the clear. Joe sees her, and without a word, they are in each other's arms. PHOTOGRAPHER [Emil]: (sighing romantically, as he takes a shot) Ah-h-h, love... ain't it purty? Emil often told a story about how, despite originally having only these several lines in the script, he ended up with all the lines of each of the reporters in the scene. 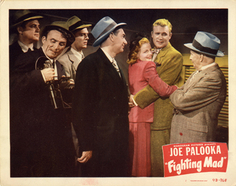 Just after he helps the girl in the foregoing action, Emil and four reporters begin firing questions at the boxer's manager "Knobby Walsh," played by Leon Errol. According to Emil, Errol was a stickler for precise timing and wanted the reporters' questions coming at him one right after the other, so fast that he could barely keep up with them, but timed just right to make a brisk back-and-forth flow of questions and answers. Each time they tried to shoot the scene, however, one or another of the reporters would hesitate a split second before barking out his question, and this broke the flow Errol was looking for. Emil was the only actor getting his line out at the exact moment he was supposed to. Errol was getting frustrated with this after several takes, and one by one he gave the other reporters' lines to Emil. By the time they finished, Emil ended up shooting the scene with all the other actors' lines! Originally titled A PALOOKA NAMED JOE, this was the fourth in a series of over ten "Palooka" movies, based upon a comic strip by Ham Fisher, made by Monogram Pictures starring Leon Errol and Joe Kirkwood Jr.
Emil had great admiration for Leon Errol, a very well-known comedian who is now mostly remembered for a long-running series of two-reel comedies he made at RKO in the 1930's and 1940's. Emil appeared with Errol in two RKO shorts, in CACTUS CUT-UP (1949) and PUNCHY PANCHO (1951). 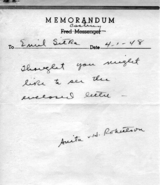 After filming CACTUS CUT-UP with him, Emil wrote in his diary that Leon Errol was "... one of the greatest of comedians." Errol had a leading role as "Uncle Gilbert" in Paramount's 1933 version of ALICE IN WONDERLAND, which featured Polly Moran, Ned Sparks, and Sterling Holloway, among others. Leon Errol also starred in RKO's "Mexican Spitfire" series of feature films with Lupe Velez between 1940 and 1943. 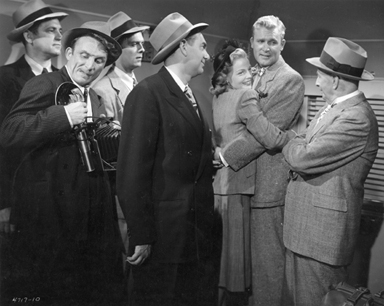 Errol starred in movies with some of the other great comedians of the past, including prominent roles in NEVER GIVE A SUCKER AN EVEN BREAK (1941) with W. C. Fields, SHE GETS HER MAN (1945) with Joan Davis, and THE NOOSE HANGS HIGH (1948) with Abbot and Costello. Although Errol is primarily remembered for his work in comedies, he also appeared in musicals, westerns, and science fiction, including BABES ON SWING STREET (1944) with Andy Devine and THE INVISIBLE MAN'S REVENGE (1944) with John Carradine. Not so well known is that Leon Errol made a series of two-reel comedies at Columbia Pictures at the same time the Three Stooges were getting started there. Although Errol made only four shorts with Columbia, he worked with several popular Stooge supporting actors, including Bud Jamison, Dorothy Granger, Al Thompson, and Johhny Kascier. He left Columbia before Emil began in working for the studio, so they didn't appear together in any of Errol's Columbia shorts. While it is common knowledge that Lucille Ball once appeared as a Stooge supporting actor (THREE LITTLE PIGSKINS, 1934), it is actually Leon Errol who is credited for first noticing the young actress and using her in a Columbia two-reeler (PERFECTLY MISMATED, 1934). In The Columbia Comedy Shorts by Ted Okuda and Edward Watz (McFarland, 1986) Lucille Ball is quoted as saying, "Working with Leon Errol and the Three Stooges was my first training in slapstick and real physical comedy. And I very much appreciated training with some real greats." 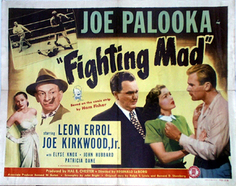 Seven months after shooting this scene in FIGHTING MAD, Emil received a memo from the Casting Office at Monogram Studio. 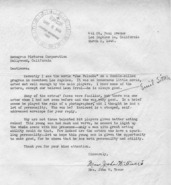 It didn't say much but it was attached to a letter the studio received regarding Emil's performance as a "photographer" in FIGHTING MAD. Emil's first fan letter! The memo and the letter can be viewed below.